Sunday extended from Wanstead to High Beach although from 10.05.36 until 09.08.36 buses were curtailed at EPPING FOREST Warren Wood House whilst Road works were being carried out. Sunday Q allocation withdrawn and new types introduced. Upton Park (U) type change. Saturday withdrawn between Camberwell Green and Herne Hill but extended on Sundays from Camberwell Green to Norwood Junction via withdrawn 196. Saturday West Ham (WH) allocation added. Sunday only Norwood (N) allocation replaced by increased Upton Park (U) and new Camberwell (Q). 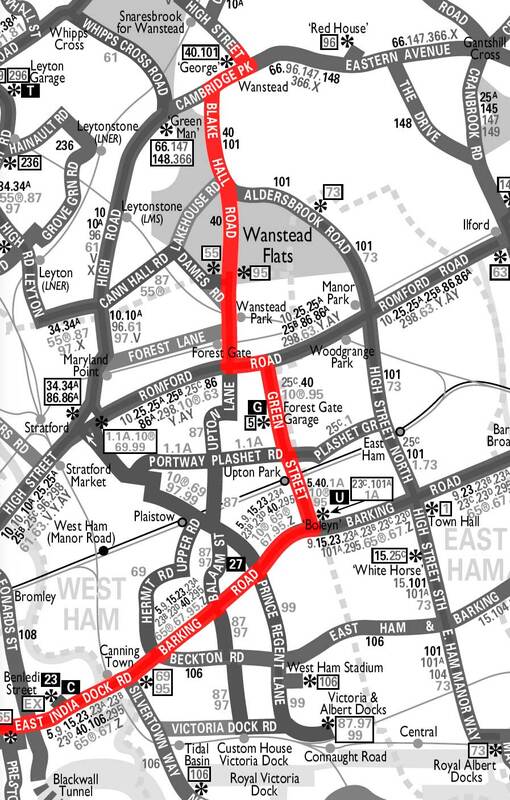 Mon-Fri withdrawn between Wanstead Flats and Wanstead replaced by revised 162 Route. Mon-Fri Camberwell and Upton Park allocations withdrawn. Upton Park RM's replaced by RML and West Ham RTL's replaced by RM. Mon-Fri West Ham (WH) allocation transferred to Poplar (PR). Sun withdrawn between Poplar and Wanstead. Sat Q allocation introduced to replace 40A allocation. Sunday withdrawn between Herne Hill and Norwood Junction except for restricted Route to Norwood Garage. Withdrawn between Poplar and East Ham and between Herne Hill and Norwood Garage. Mon-Fri peaks extended from Poplar to North Woolwich via withdrawn 40A. RM replaced by Crew Titans. Poplar (PR) closes - allocation transferred to Camberwell (Q). Withdrawn between Aldgate and Poplar evenings. Sat and Sun evenings withdrawn between Aldgate and Poplar. Mon-Fri Route diverted at Limehouse to Canary Wharf. Mon-Fri reverted to direct routeing via East India Dock Road instead of Canary Wharf. Extended in Poplar to Blackwall DLR Station. Diverted at Camberwell Green to Dulwich via Goose Green. New contract commenced and NV type introduced. Withdrawn between Aldgate and Blackwall Station. Re-routed via Gracechurch Street - Fenchurch Street - Aldgate - Aldgate High Street and St Botolph Street in both directions following the completion of Aldgate Gyratory removal works.